Okay, we know that Sunday's DIY day, not Monday, but we've just discovered Netflix's Make It pages. It's a place you can submit project ideas for different ways you could setup Netflix or tie it into your life. There are a few suggestions up there right now, such as a way to create an evening playlist, mixing different TV episodes rather than simply binge-watching a single series. The first finished project though is the ultimate one-touch chill switch. 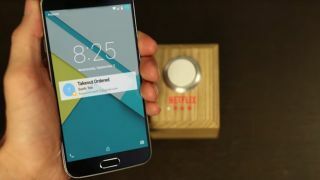 The chunky button (which you would absolutely have to mash with your fist - the only way to actuate such a switch) at once starts up Netflix on your TV, dims the lights, silences incoming phone calls and orders takeout. Those last two might be mutually exclusive if you live somewhere the delivery drivers commonly struggle to find, however. But they're the optional extras; the main thrust of the project is to recreate the IR signal of your TV's Netflix button and get it to dim a Philips Hue lighting array. We'd love to tell you it's a simple project, but you're going to need some electrical knowhow and a little light soldering skill. "You should be comfortable with a soldering iron and have a solid understanding of electronics and programming before embarking on your journey to one-switch watching," says Netflix. But if that sounds like it's you, and you've got nothing planned this avo, then it has all the schematics and materials lists you could want to make your ultimate chill button.